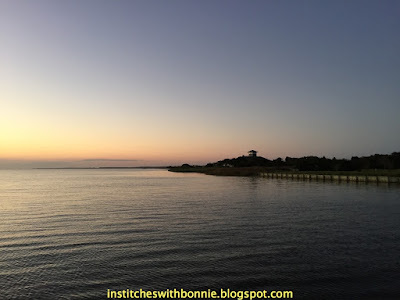 Within 24 hours of getting home from retreat we were off to the beach house -- the first time I've been there since May! 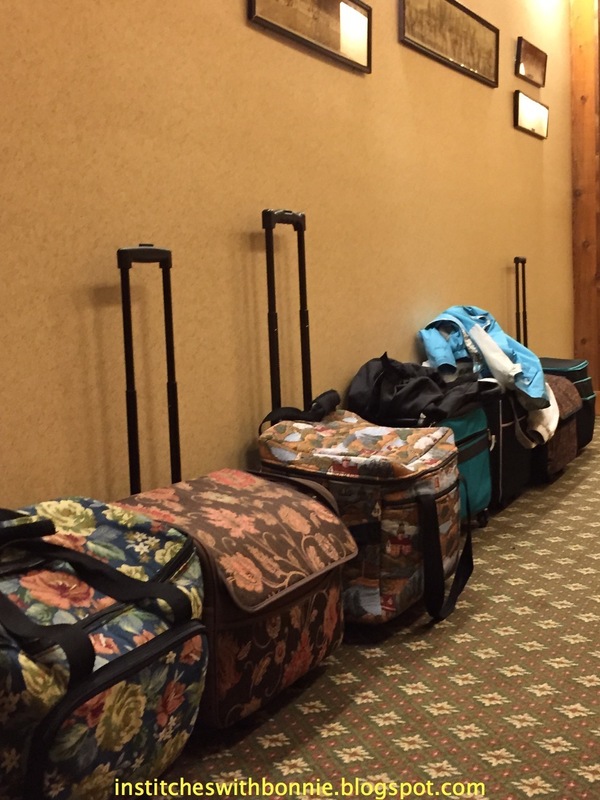 Here are some more photos and commentary about retreat. It was a great time despite 4 days of rain. At least the hurricane didn't add more excitement! Mary brought a finished scrap quilt to show to the group. Yummy! 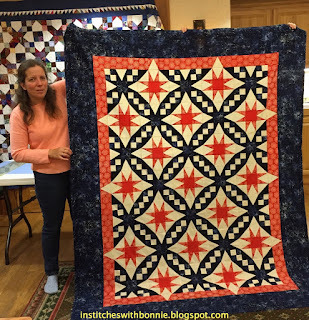 I love the half square triangle borders. Nice job Mary! And now some of the finishes folks had while at the 3 and a half day retreat. This is Michelle's quilt top. I can't remember what she said the name of the block was. I believe a lot of the units were done before she go here. Nice job getting the whole quilt top together. I wonder if she will put borders on it or not? Behind to the left is Mary's quilt that we had hanging the entire weekend. 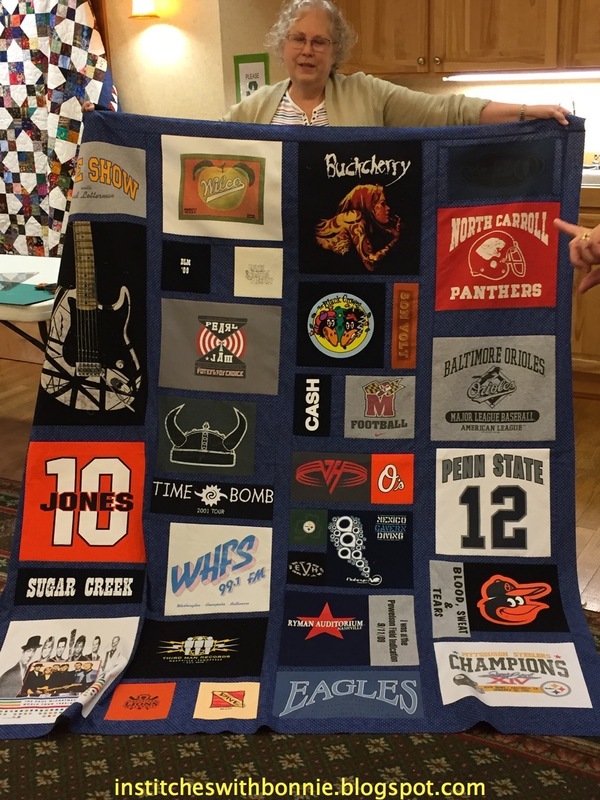 MaryBeth finished another t shirt quilt. 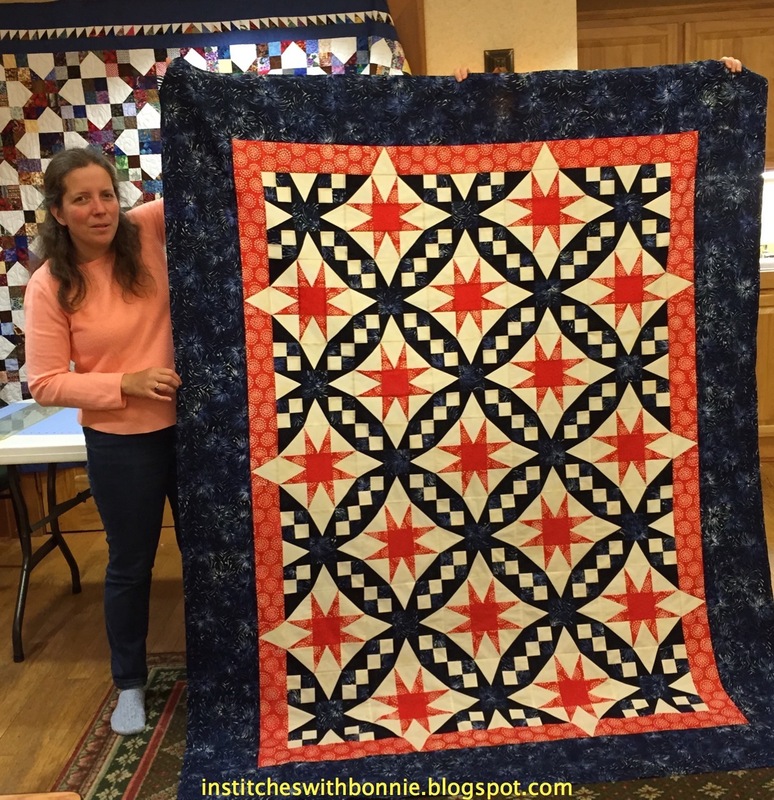 You can see another one she made at the FCQ June retreat here. Scroll down to see it. 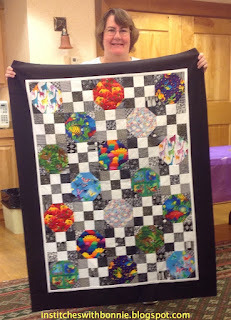 Sharon got her FCQ Cuddly Critter Challenge quilt top done. 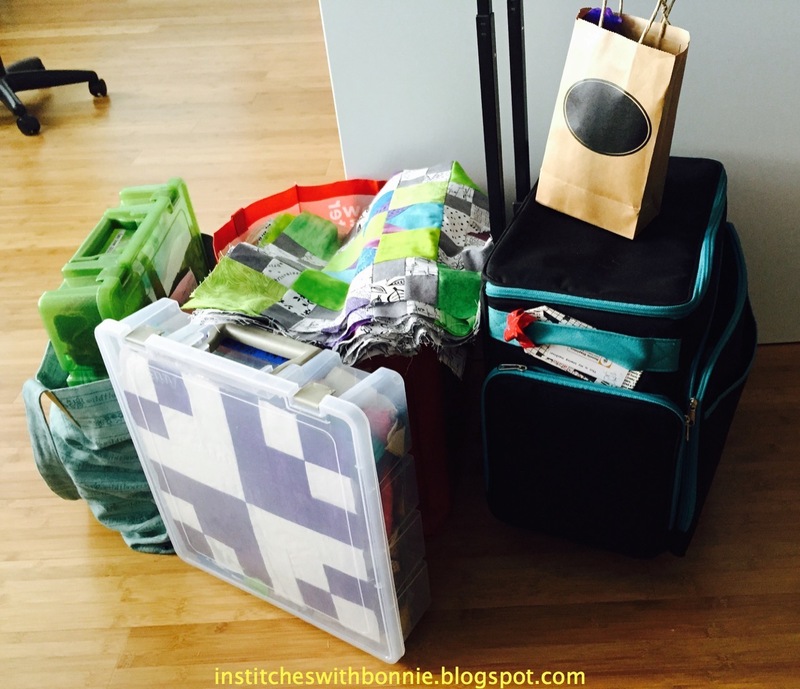 Anyone who wanted to participate was given a bag of fabric to use. The guild was given a lot of fabrics to put to use -- thus the challenge. 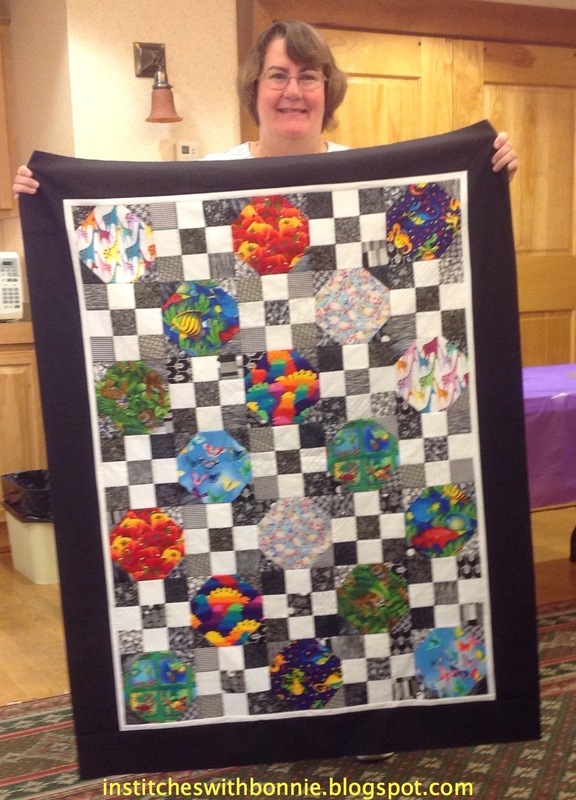 Sharon will get this quilted at home and then turn it in. I need to check out my bag more thoroughly as I have hardly even looked at it since I got it in June. 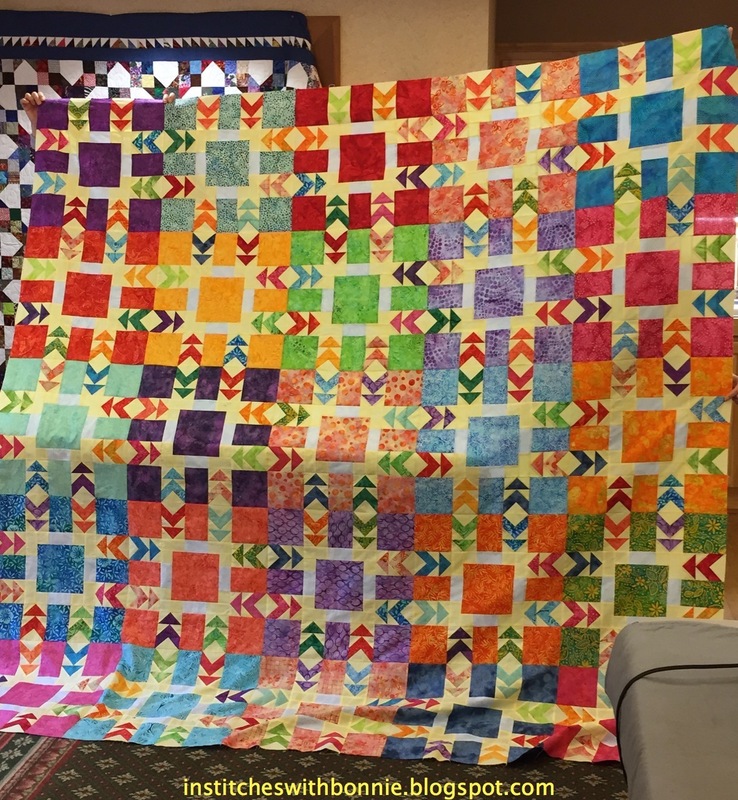 The quilts will be donated to Project Linus after the FCQ Quilt Show in April. Here's my set up. We have narrow tables that can get exceedingly messy. Or, maybe that's just my table! I did a fairly good job keeping the mess more controlled this year. Behind me you can see half of Dorothy, my Row by Row buddy, and Kay. We get together every few months to embroider or sew. Lots of fun. I'll end this with a photo I took the last night we were in Nags Head. There was a rocket launch from Wallops Island Wednesday night. We had tried to watch an earlier one but the rocket blew up. (Seems to me we actually saw the flash of the explosion.) This time the launch went well but we sure didn't see much. Just one dot of light traveling up really quickly. I tried to get a picture of the dot but, hey, this is a cell phone camera... what did I expect? This is what is waiting for me. 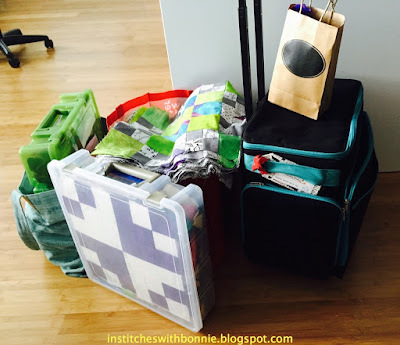 It is time to unpack, put the sewing machine back in place, unpack the bags. And, get back to work. Halloween is creeping up on me and I have several shirts to make for some cute little girls! I'll share more photos from Nags Head soon. The ocean was amazing! Food was fabulous, although I doubt if I took any food pictures. And, best of all I did some cross stitch and sweater knitting. I'm connecting up with Can I Get a Whoop, Whoop? and Let's Make Baby Quilts. I'm curious about your machine bag. Did you purchase it online or locally? 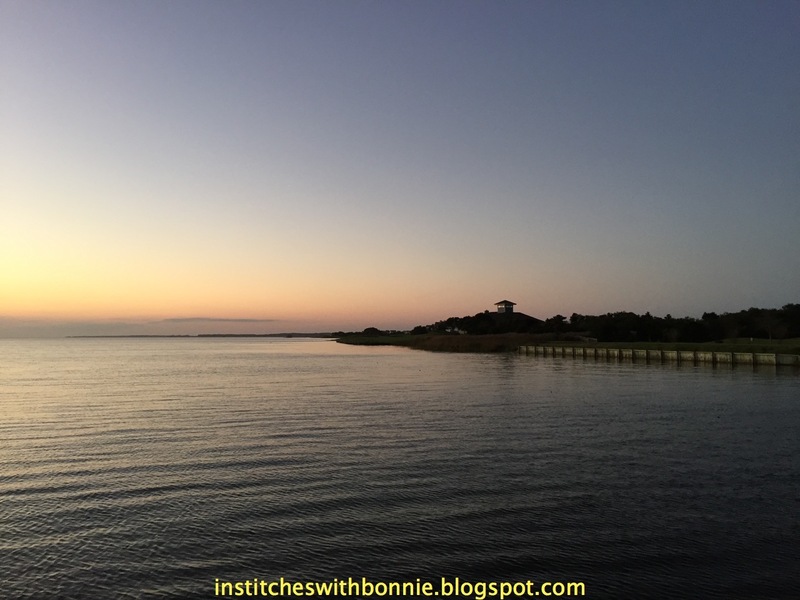 We loved our visit to the OBX and long to return. So I'm looking forward to seeing your pictures. What a wonderful retreat! Looks like everyone was productive and had a good time. 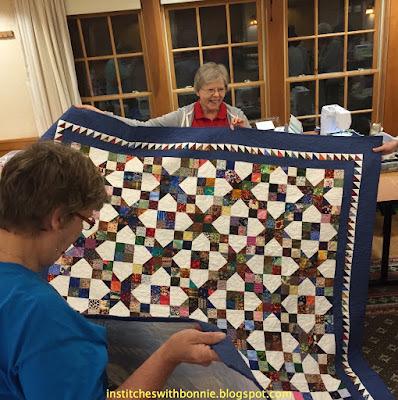 You have a talented group at your retreat. 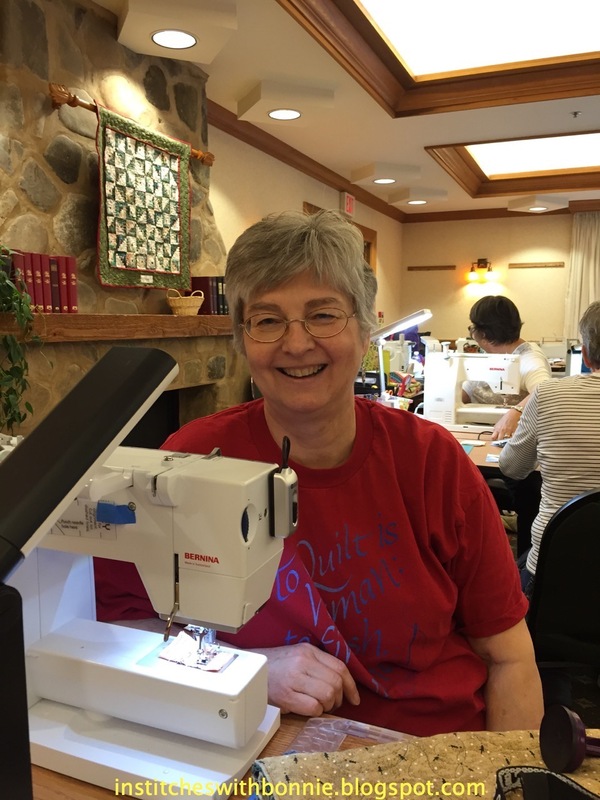 Hope you've been able to get back into the sewing room and do some stitching.